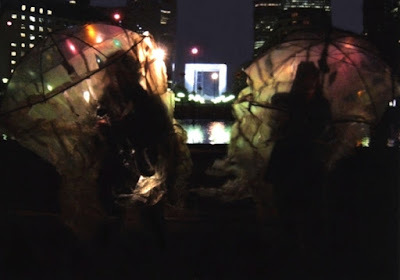 « Rain Marchers » is a spectacle where elements of physical theatre and dance are combined into a performance based on the notions of the plasmatic body and the art brut. Caracters: Six beings into their “umbrellic cocoons”. Plot: Into a dark and humid place, luminous and lonely creatures are wandering around into their cellophanic cardigans. During their course they move, stop, form spirals; they discover and are being discovered. Scarcely thought do they leave their transparent nests to reveal their interior identity. The communication with their homologues is impermanent until their final union and the beginning of a new itinerary. The performance « Rain Marchers » has been presented into the Festival Mimos, Beyrouth Street Festival, Festival de Trop and to The Printemps de la Démocratie with the title « Les Marcheurs du Temps ». It is planified to be part of the 3rd International Street Theatre Festival of Athens. In this occasion the Illustrations Confuses will be presented on the Art Market of the Kakoyiannis Institution everyday from 11am to 9pm, with material of its previous performances. Dimitri Rekatchevski will also hold a seminar about Directing the physical theatre, on Kakoyiannis Institution on the 2nd of July at 12.30.